Our 1-Person Hip-Pack Emergency Preparedness Kit is a premium single person survival kit that includes essential items to survive 3 days in an emergency. It also includes our hand crank 4-in-1 Dynamo Radio Flashlight that never needs batteries and can charge a cell phone. 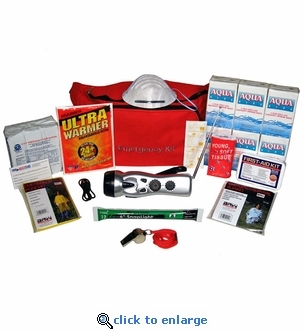 This emergency preparedness kit provides food, water, warmth, light, and first aid supplies. Items expire 5 years from the date of manufacture.